Another week, another crime. Yesterday we welcomed boys from around the Dallas/Ft. Worth area to our second, and final, CSI summer camp. 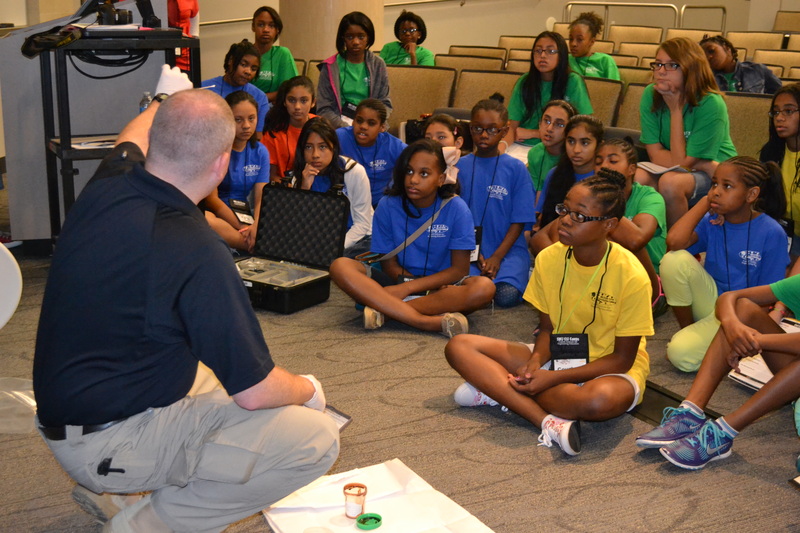 In order to provide a real-world look into the lives and professions of those who work in CSI-related fields, campers were treated to a presentation by Dallas Police Department’s Sean Kearney. 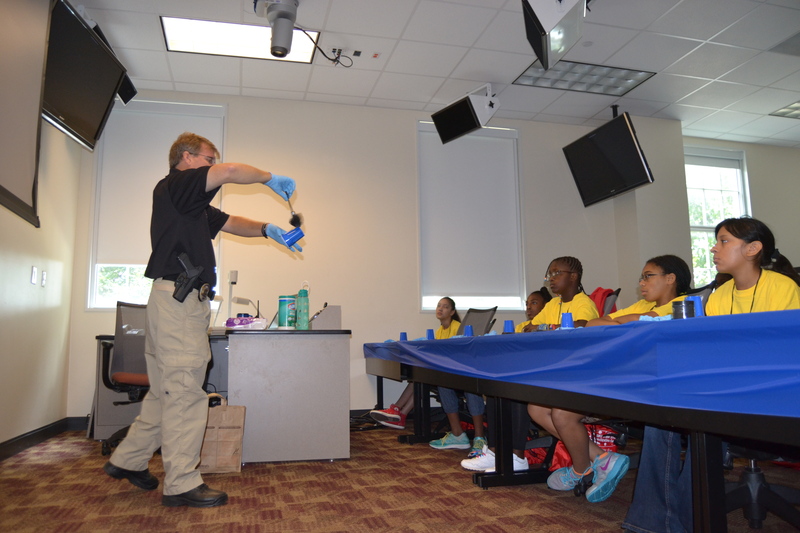 Kearney introduced campers to the types of skills and tasks required of crime scene investigators. for a scaled sketch of the scene. 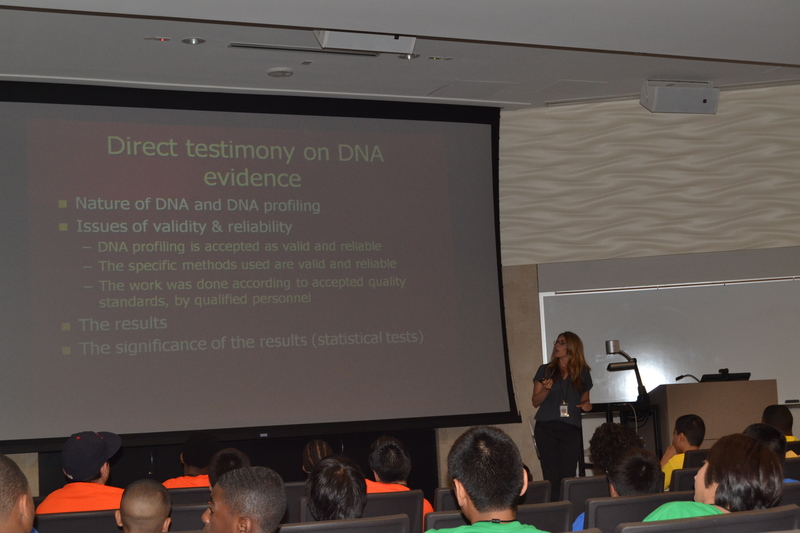 After the scene was thoroughly processed, campers learned about DNA evidence through a presentation from Forensic Biologist Amanda Webb. Webb’s job as a forensic biologist requires her to process DNA evidence found at crime scenes. When asked what was the most unique object she’d ever had to test, she replied that “The craziest thing we had to test was a fried chicken leg with a big bite taken out after a crime was committed.” This goes to show that evidence can be everywhere! 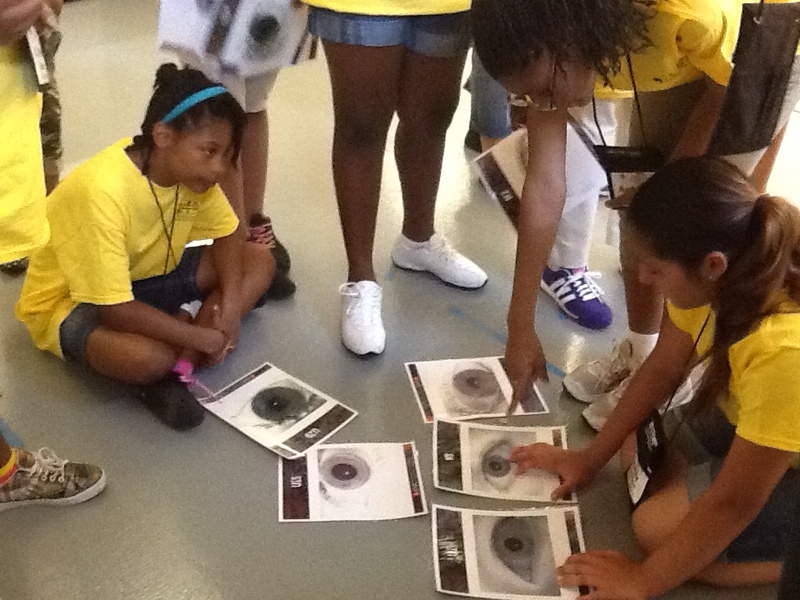 Campers finished up their day learning all about change blindness, the phenomenon that explains why eyewitness testimony isn’t always the most reliable piece of evidence. And just so we don’t let the campers have all the fun, you can get in on the CSI action by watching the following videos. These videos will introduce you to the change blindness phenomenon and also allow you to test your observational skills. 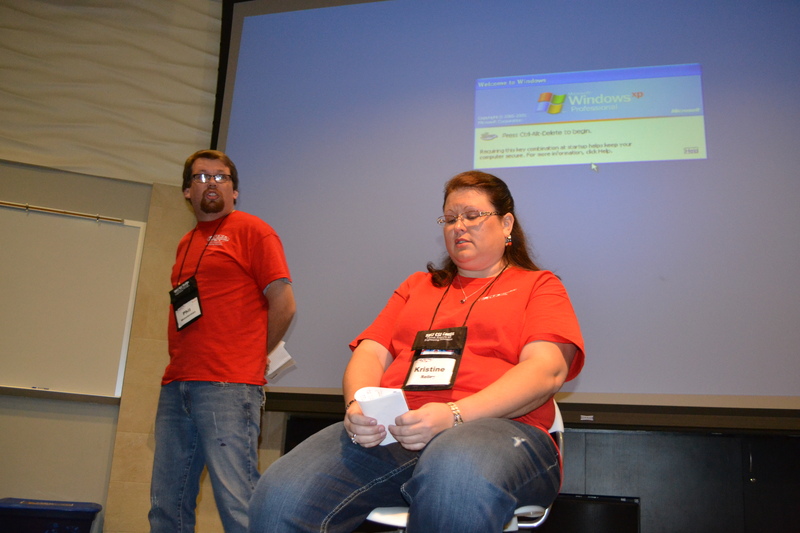 This knowledge of change blindness came in handy when campers observed an interview with an eyewitness. 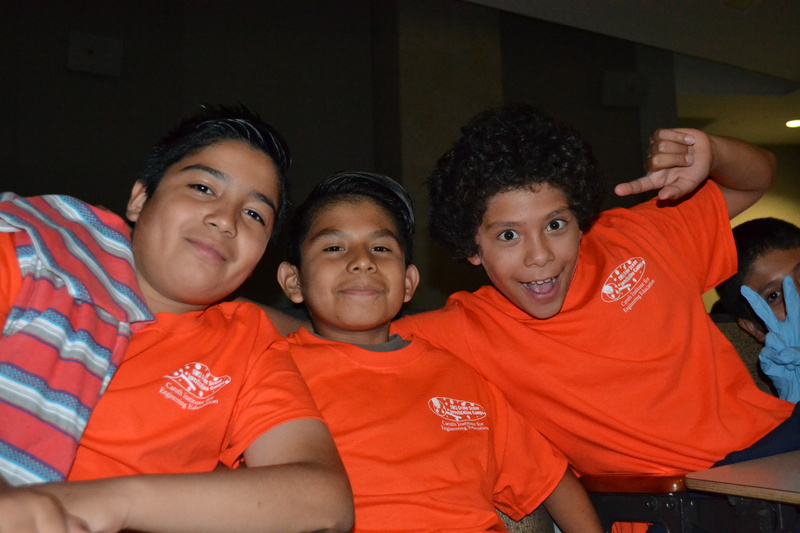 And lastly, did we mention that the campers had fun? These students were introduced to a number of new friends, a fact that is sure to make this coming week a memorable one. Stay tuned throughout the week to follow their investigation! Who says humans are the only ones that can get in on the CSI action? 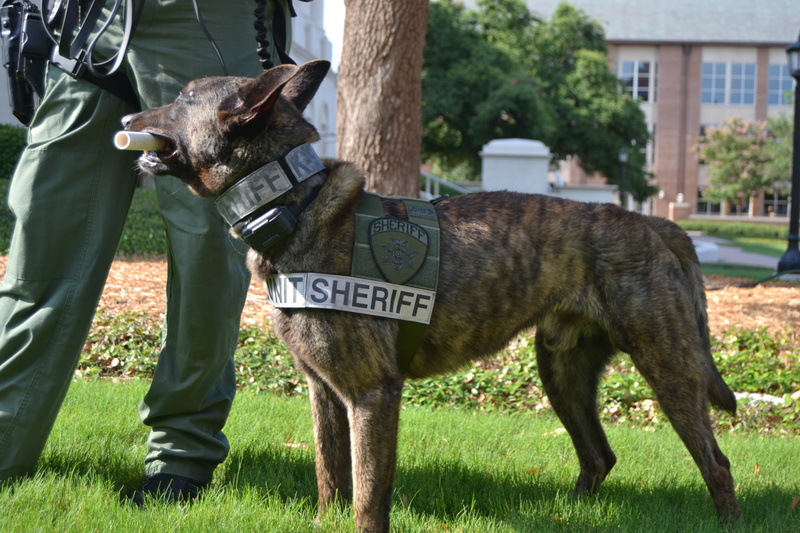 This morning, our CSI girls were joined by the furriest of this week’s presenters: K9 Rocky (and his handler Deputy Clayton Wood). 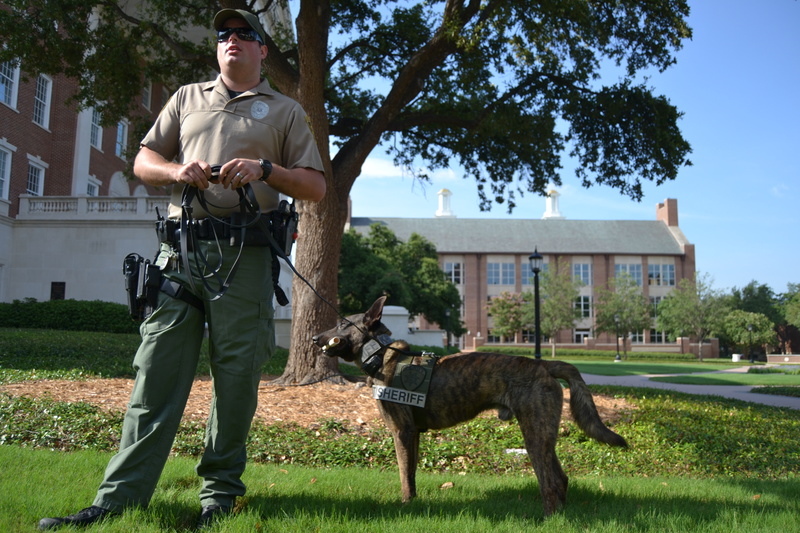 K9s play a key role in many investigations, and Rocky had a chance to show off his tracking skills. 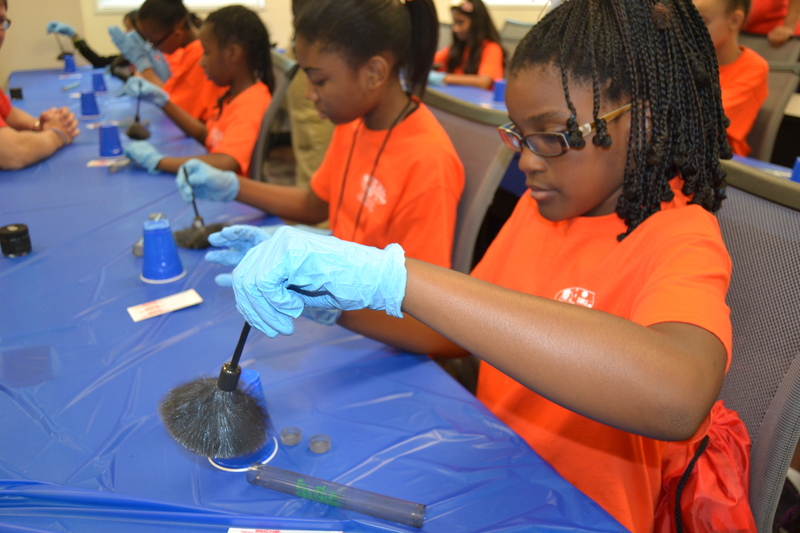 After the wonderful K9 unit presentation, the campers got straight to work processing their first piece of evidence: a fingerprint! 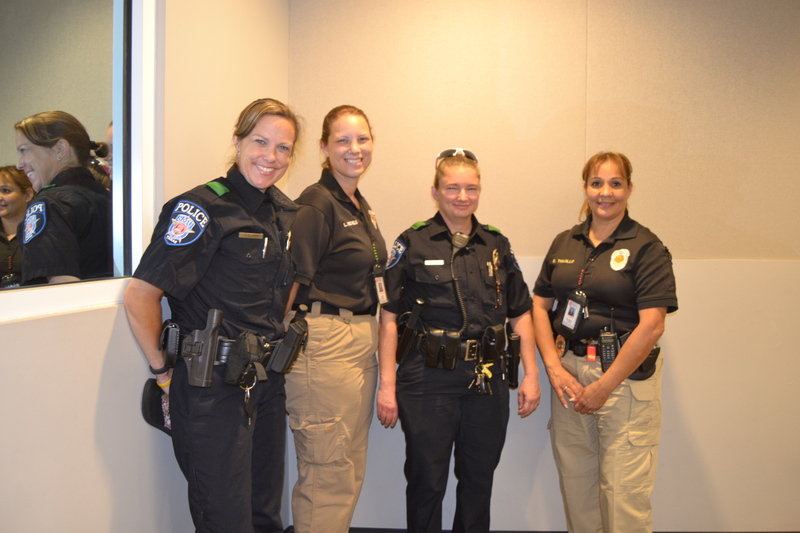 To learn how to properly dust for and collect a fingerprint sample, the girls were joined by members of the SMU Police. and analyzed the fingerprint found at the scene of yesterday’s kidnapping. 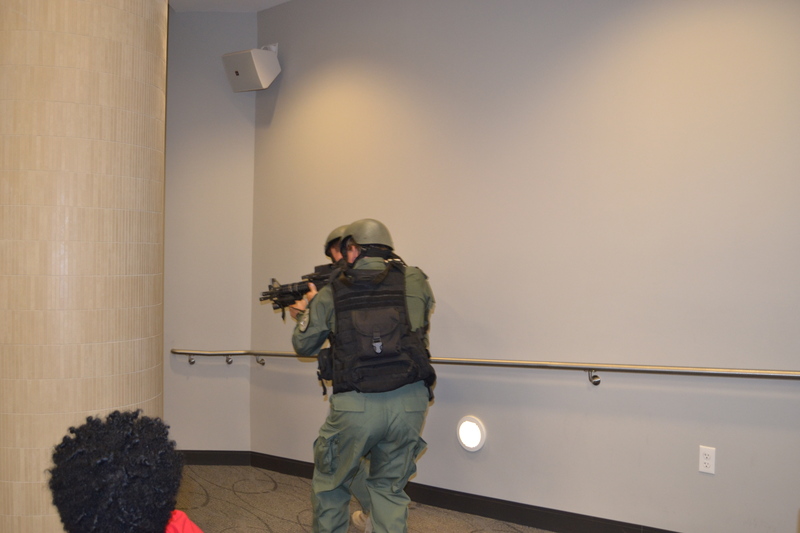 and gave a real-world look into the day in the life of a SWAT team member. 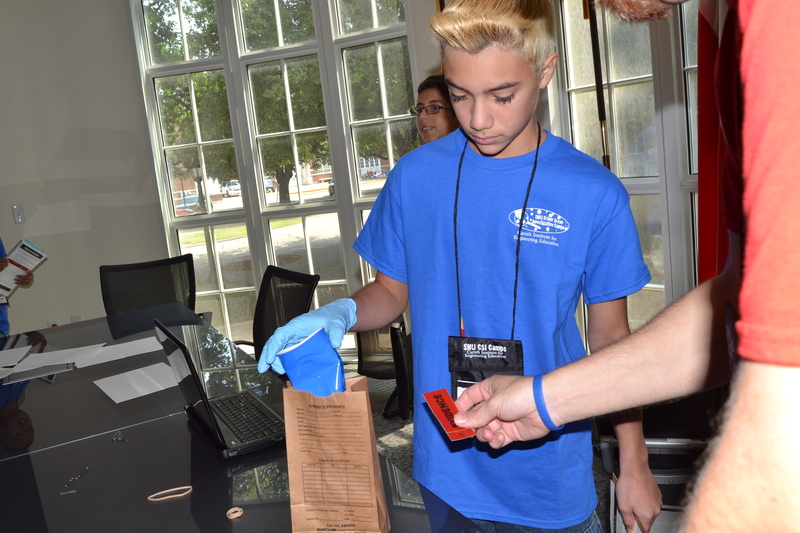 Tomorrow promises to be another fun-filled CSI day as the campers work to further narrow their list of suspects. Stay tuned! 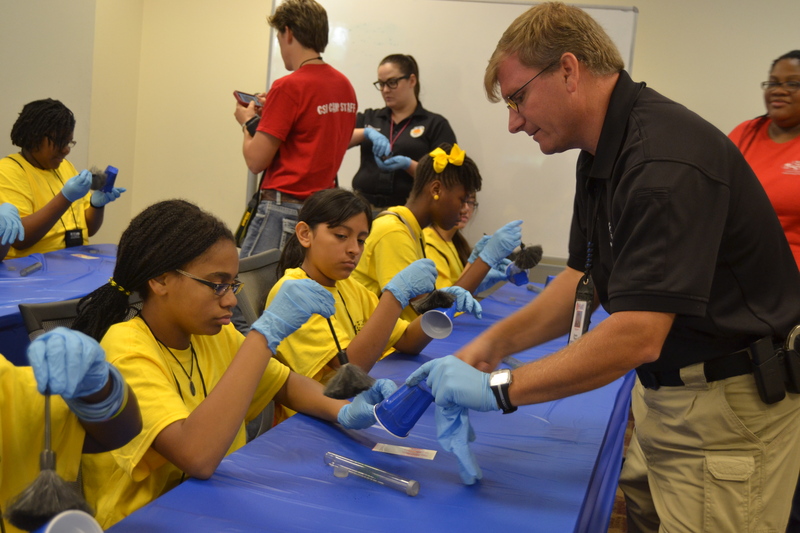 Sean Kearney, Dallas PD, displays evidence to campers. What happened next was most unfortunate… A kidnapping occurred on campus! Good thing we have this team of CSI investigators-in-training to help solve the crime. and taking measurements for a scaled sketch. 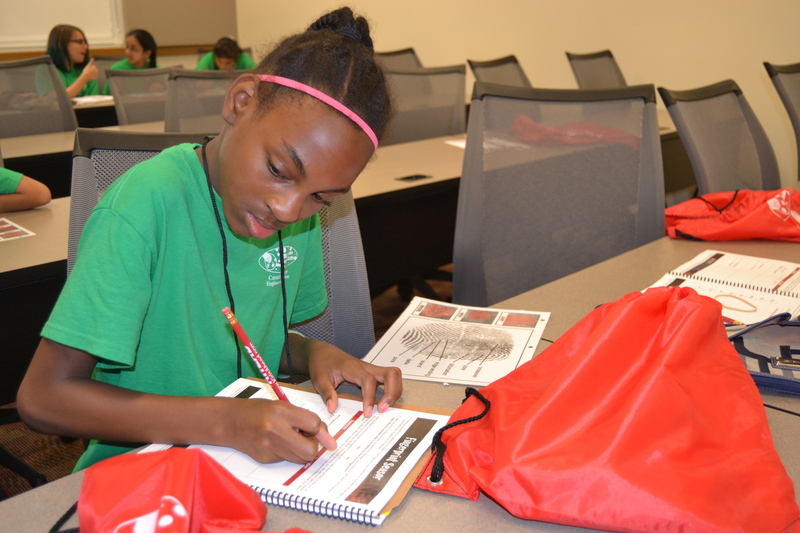 Then, after thoroughly processing the crime scene, campers were visited by Amanda Webb, a biologist with the Dallas County Crime Lab. 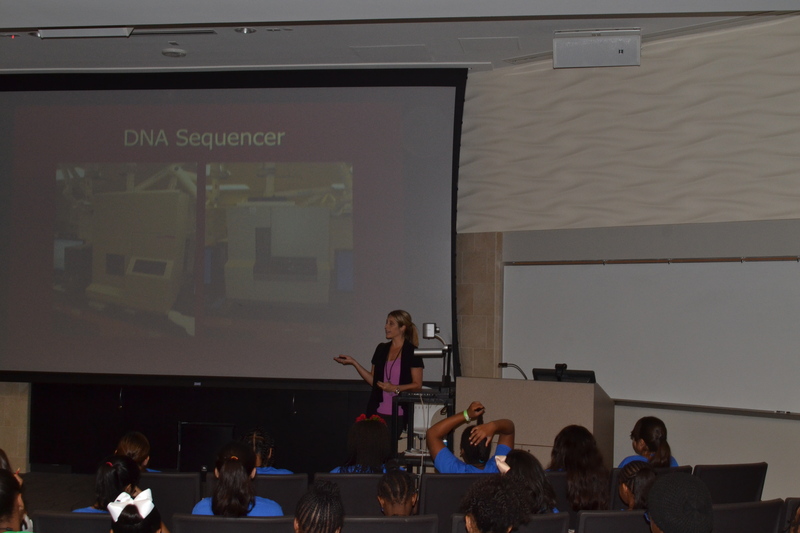 Webb’s visit was all about DNA, and campers learned how DNA is used to investigate crimes. 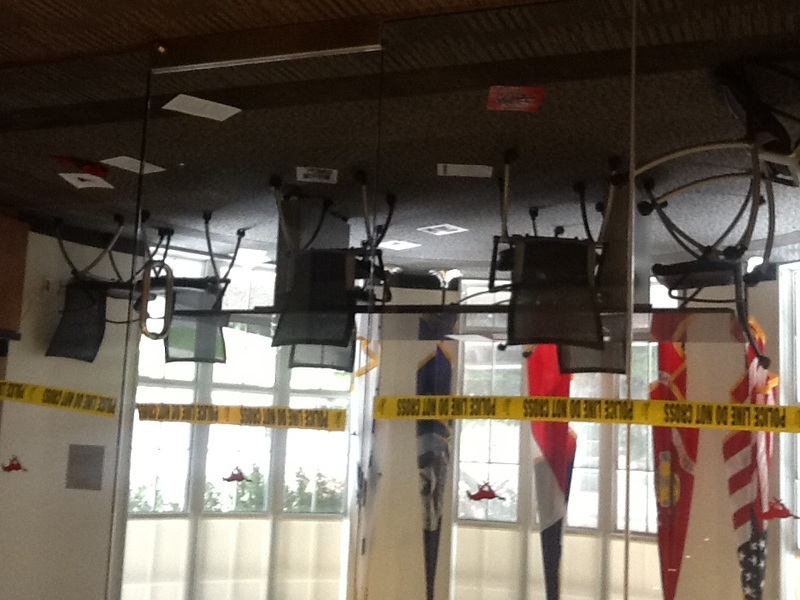 Stay tuned to keep apprised of all the latest developments of our CSI investigation! There’s been a kidnapping on campus! 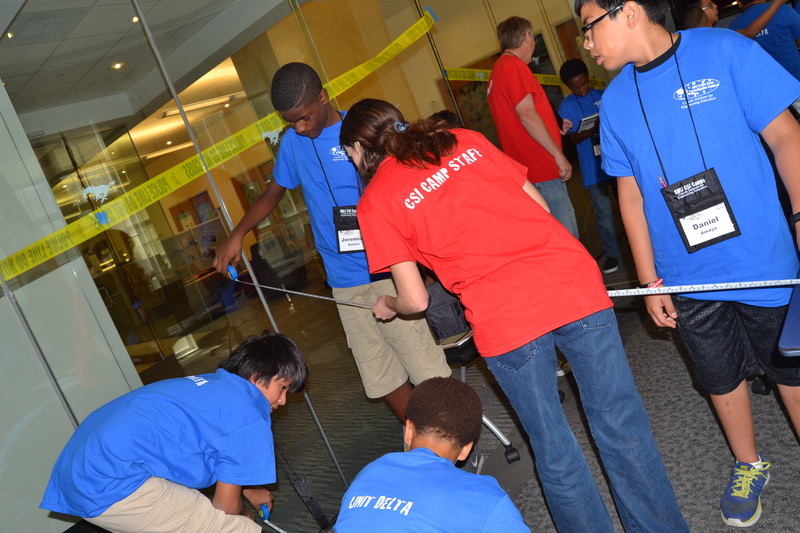 Good thing we have a team of CSI investigators-in-training to help solve the crime! and unit Delta completed a scaled sketch of the crime scene to aid the investigation. But it definitely has not been all work and no play… our campers have been having a great time getting to know each other this morning! 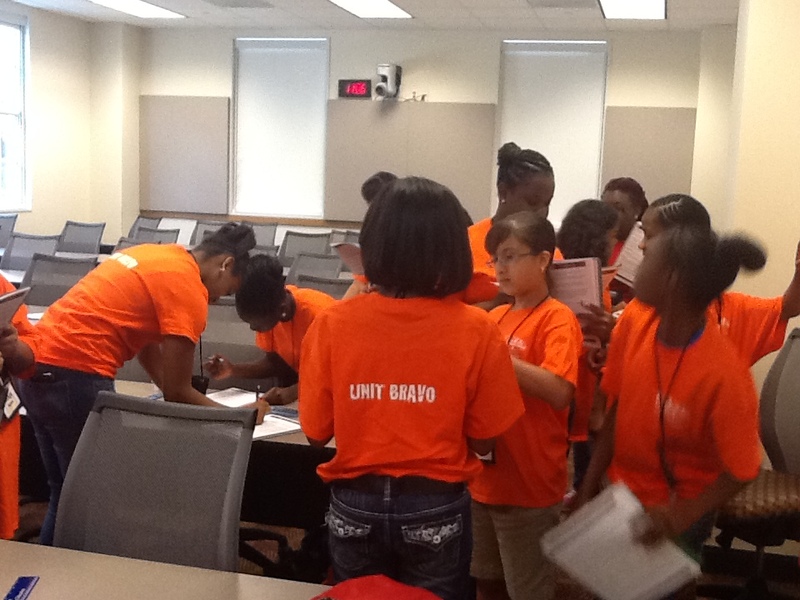 Our 3rd annual CSI Summer Camps are now officially underway! Our camp series begins with this week’s girl’s camp, and we are excited to welcome incoming 6th and 7th grade girls from the local area onto our campus. 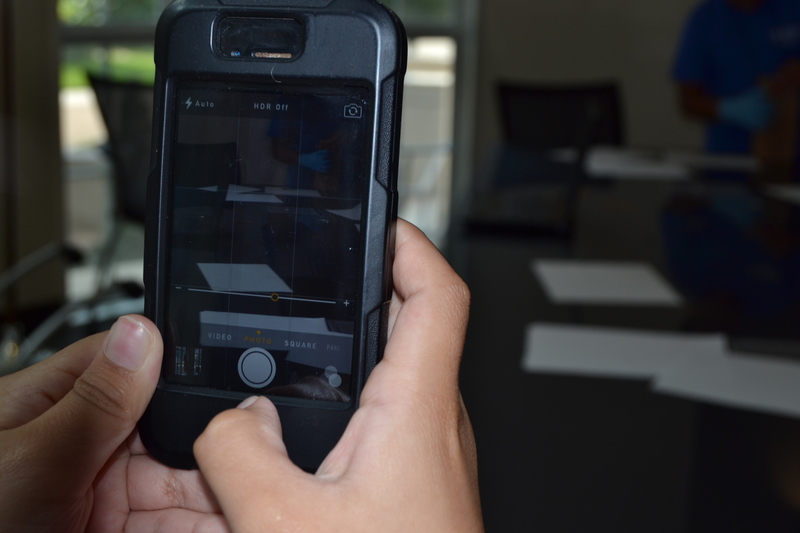 Stay tuned to hear all about this year’s activities and presenters (we’ve got some really cool ones lined up), and to help our campers catch this year’s suspect! 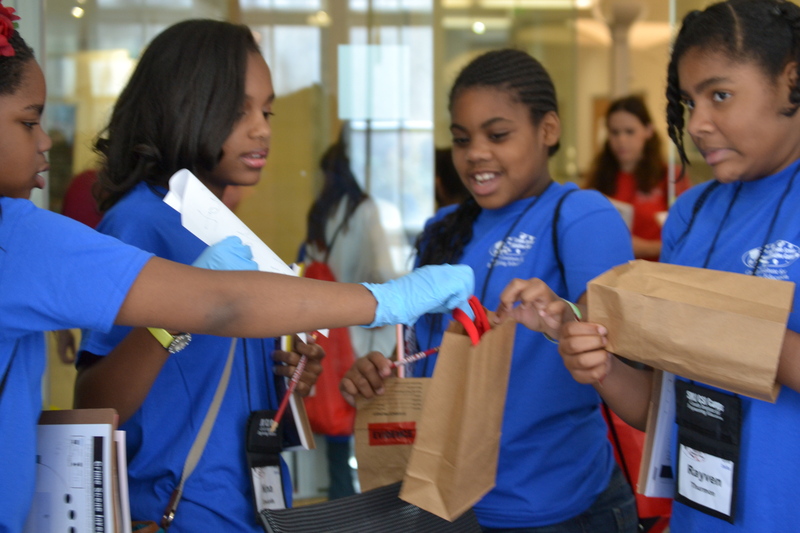 Okay, so we promise this blog won’t be completely focused on our programs, but before we jump into the meat of STEM we want to introduce you to our CSI programs. 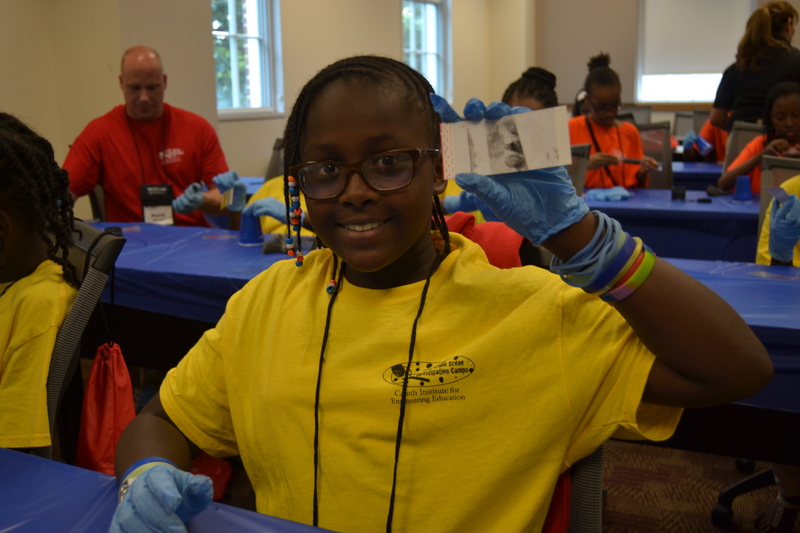 In addition to the Kids Ahead and STEM-Works websites, we have a set a programs focused on Crime Scene Investigation (or CSI). 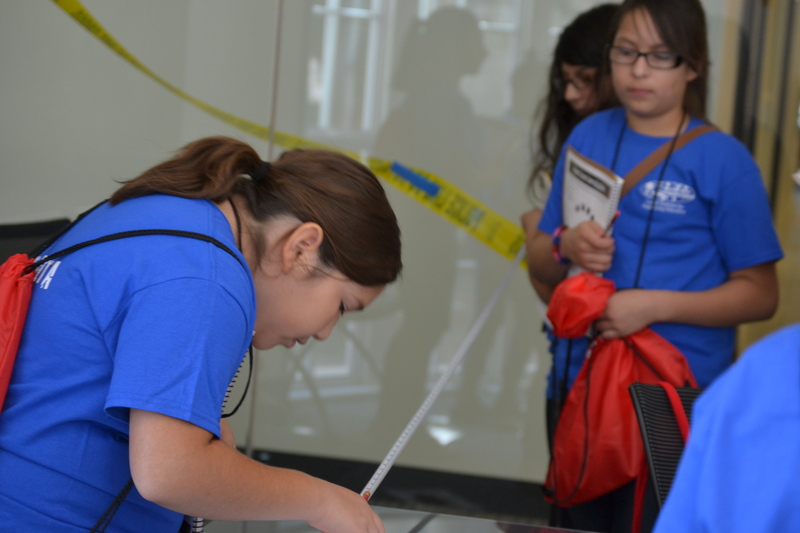 Building on the popularity of TV shows such as CSI: (Enter City Name Here), NCIS, Bones, and many others, we thought that using the framework of CSI would be a great way to introduce students to the vast array of STEM used in solving crimes. 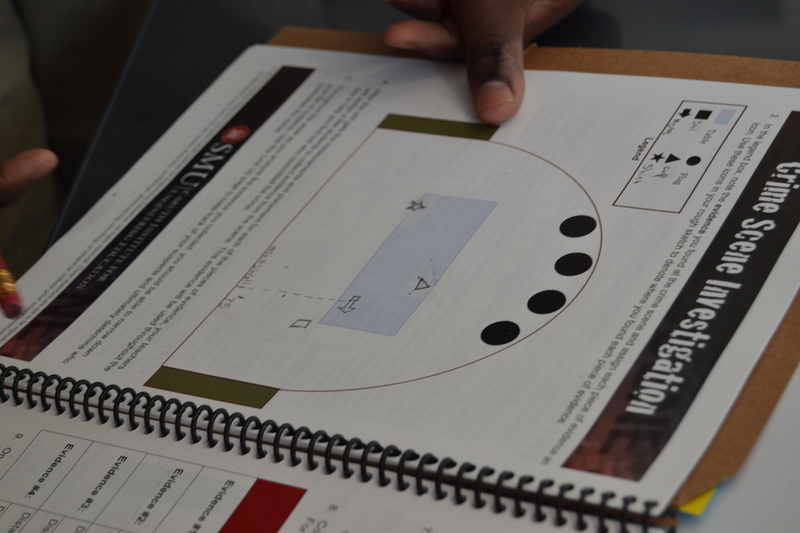 Sure, the TV shows demonstrate some of this, but we wanted to take it a step further and give students the opportunity to engage in hands-on activities that would excite them to learn more. Hence, our CSI Camps! 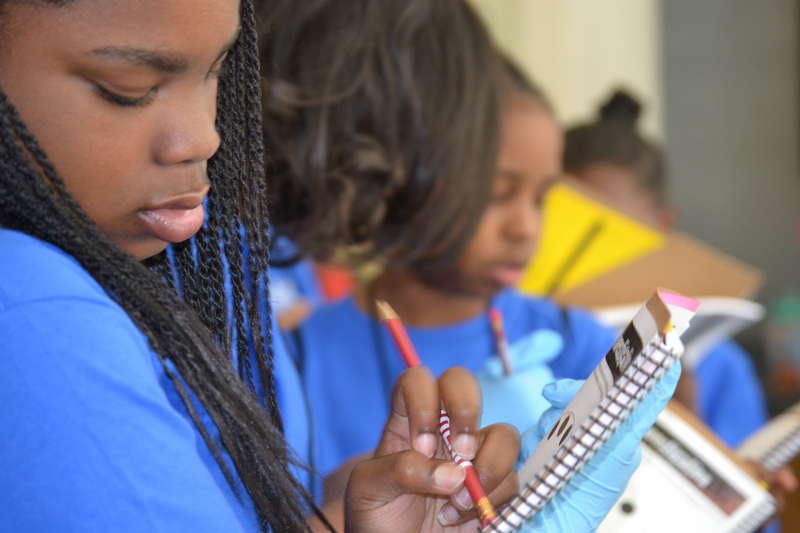 This blog will include information from our CSI camps including: activities and modifications to use in your community; stories from these events; and information about how to participate in these events. We will also build on the CSI content available on the Kids Ahead and STEM-Works websites in these posts. If you have participated as a teacher or counselor in any of our CSI events in the past and want to share your experience, please let us know! These programs are also something that you may be able to get involved in or request for your community. 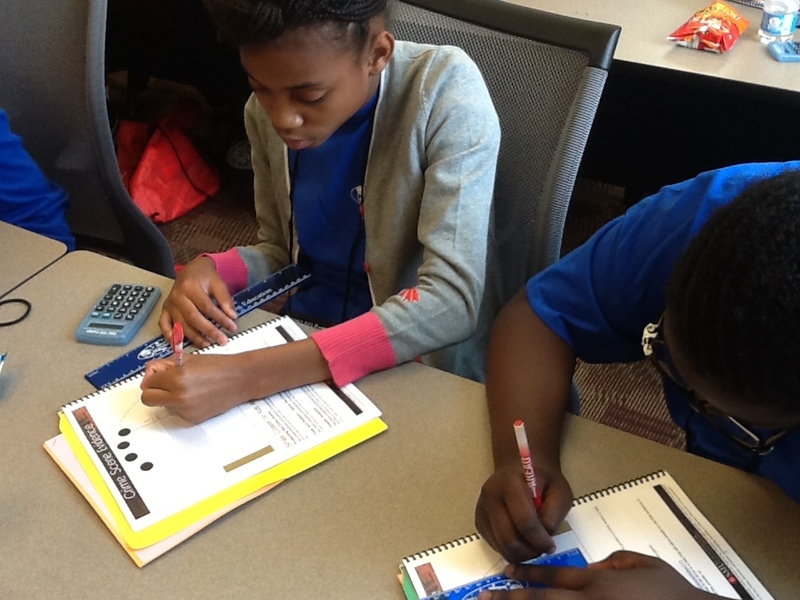 If you are interested in having us come to your community to offer a Camp-for-a-Day or Teacher Workshop, please contact us at CSIcamps@smu.edu. 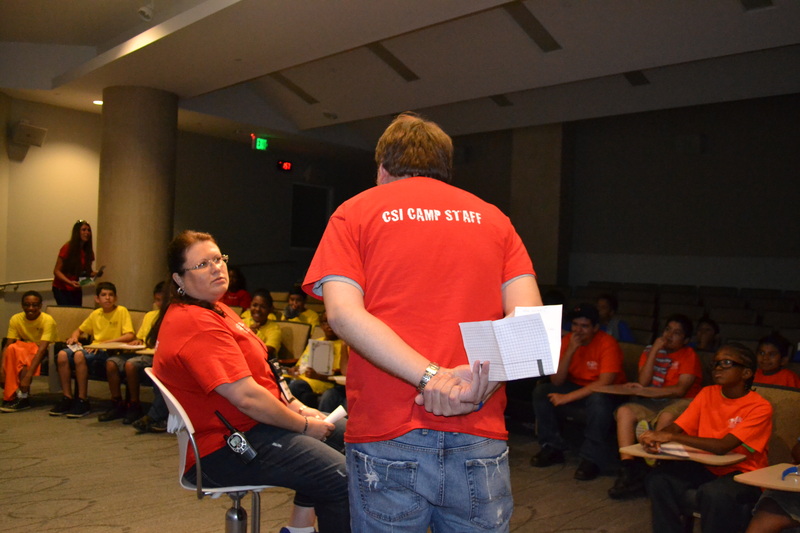 For a sneak peek at the happenings during a CSI Summer Camp, check out this recap video from the 2011 CSI Summer Camps. 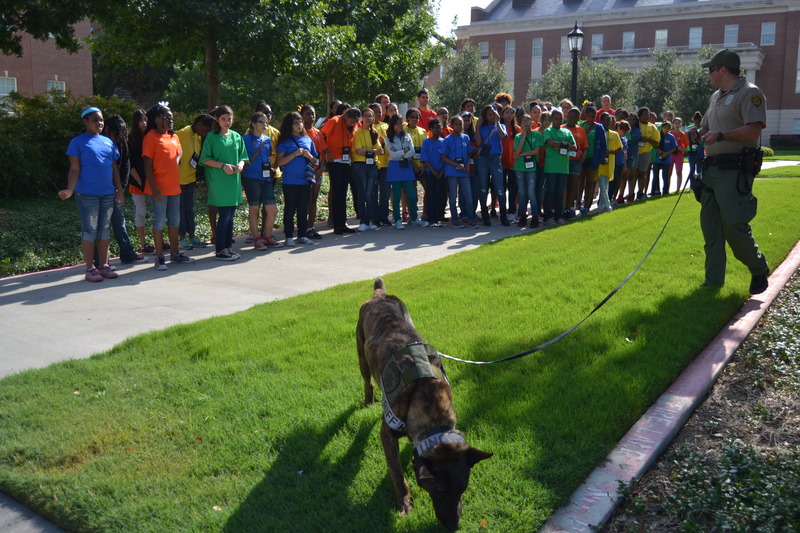 We would like to thank the Office of Naval Research and the Office of the Assistant Secretary of Defense for Research for their generous support of the SMU CSI Camp programs.